Nevermind the mugshot quality of the mug on that image:-) On the left, the computer is encoding the built-in iSight camera’s video stream in real time using Wirecast, and sending it on to a server hosted by Qbrick, where it is broadcast to the internet, including to the screen at the Second House of Sweden’s auditorium, seen on the right. The upshot? We’ll be able to do live broadcasts of Swedish jazz concerts, DJ sessions and debates straight to Second Life, as well as to the web (which is the usual way to broadcast). 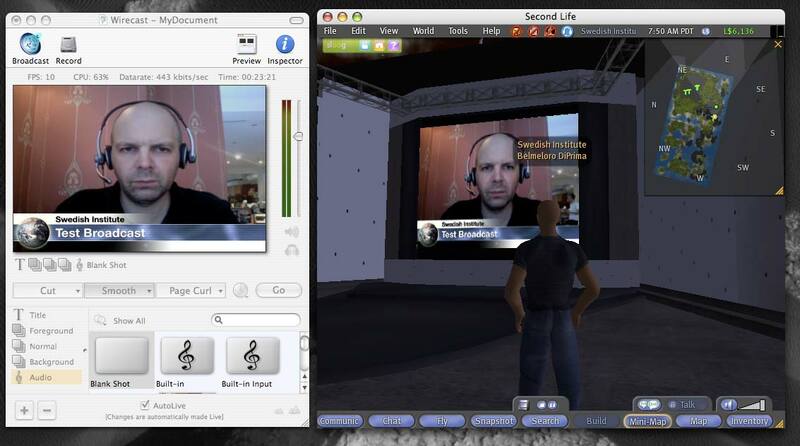 Why is the Second Life stream much more fun and groundbreaking? Because it can be viewed socially; comments can be made among the audience, questions can be sent to the real-life event, or — just as likely — spontaneous dancing can erupt. There are plenty more other things we’ll likely be able to do with this cool setup, but first, we need to test a bit more. Watch this space. This entry was posted in Brainstorm, Second House of Sweden. Bookmark the permalink.